Season’s greetings again, Displaced Nationers. And welcome back to our end-of-the-year bookfest! Moving right along (hic!). 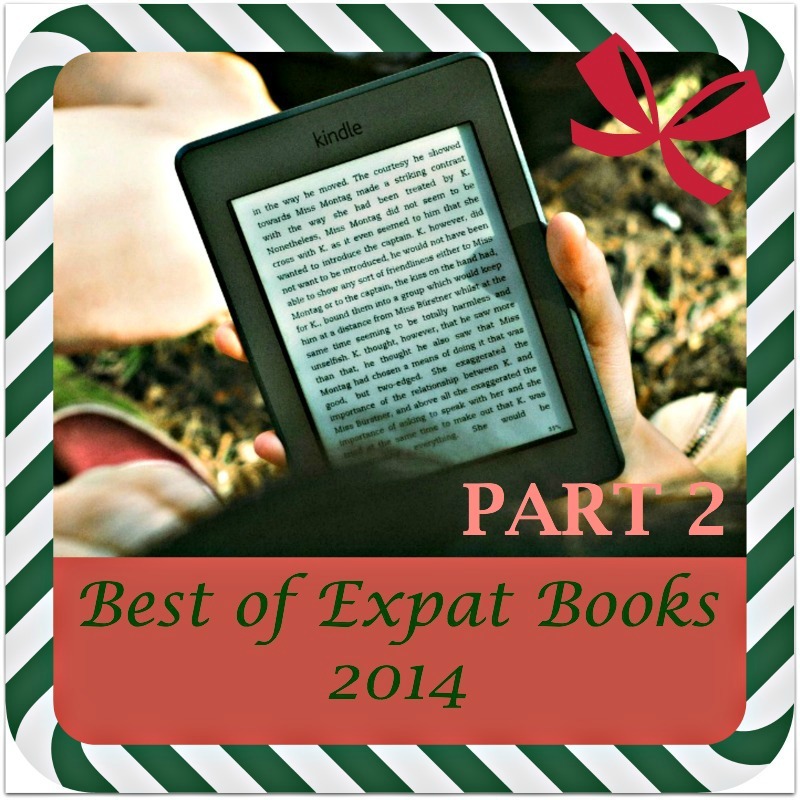 In the first part of this BOOKLUST WANDERLUST series, posted yesterday, our BOOKLUST, WANDERLUST columnist Beth Green and I presented a list of 2014 expat books in the categories of Travel, Memoirs, and Cross-cultural Challenges. Contributions by Beth are in green (most appropriate, given her surname!). Synopsis: A collection of Moroccan recipes, both traditional and contemporary, interwoven with stories and anecdotes inspired by people, food and travel experiences as seen through the eyes of Rob, an Australian photographer, and Sophia, his French/Moroccan wife. Expat Credentials: Rob first met Sophia in Sydney, who had freshly arrived in Australia from France. They were both on a food photo shoot for an ad agency. Fascinated by her half-Moroccan (she was born in Casablanca), half-French heritage, he was only too happy to join her on an extended tour of Morocco, which resulted in both marriage and this book. Synopsis: Wanita shares recipes she has collected from her elderly neighbor, her mother-in-law, and Italian friends she has made during her six years in Sicily—recipes that have passed down from generations, several of which, she suspects, have never been outside Sicily! Expat creds: Wanita met her Sicilian husband on the Internet. After a 3-month online romance, he visited her in California; two weeks later, she accompanied him back to Sicily to get married. They now have an infant daughter. How we found out about: We’ve pinned several of her Sicilian recipes to our IT’S FOOD! board. Synopsis: A collection of 100 sweet and savory recipes that reflect the way modern Parisians eat today, combined with Lebovitz’s personal stories of life in the world’s culinary capital. The book also features lush photos of Paris and of Lebovitz’s kitchen. Expat creds: Lebovitz is an American pastry chef who has been living the sweet life in Paris for a decade. Before moving to France, he made his name at Chez Panisse in Berkeley, California, with celebrity chef Alice Waters as his mentor. How we found out about: We are among his throngs of followers, keeping up with him any way we can: Facebook, Twitter, Pinterest, his monthly e-newletter… My Paris Kitchen (his 7th book!) has been named best cookbook of the year by Amazon. Synopsis: Not just a cookbook, The Edible Atlas introduces readers to the cultures behind the flavors and looks at why people eat what they do. Expat credentials: Mina Holland, from the UK, has lived both in the USA and in Spain. She’s the acting editor of Guardian Cook. How we heard about: Titles about food always catch our eye, and the idea of traveling around the world a mouthful at a time? Tantalizing! A review in Guardian Books first brought it to my attention. TCK Credentials: As the editors point out, that this is a rare book BY third culture kids, not about them. Synopsis: Your mother is Swiss, your father is from the Philippines and you have so far lived in five countries, none of them your passport country. Who are you? Where are you from? Where is home? And what did you eat for breakfast? If you are a friend, this book will guide you. If you are a teacher, it will enlighten you. If you are a parent, it will spell it out for you and if you are an employer, it will convince you. Here they are, the cultural chameleons, the young global nomads, the TCKs—Third Culture Kids—from around the world, telling you their story. How we heard about it: Initially from a Facebook post. Word is spreading fast on social media. One of the coolest things about this book? It features TCK art as well as writing. Synopsis: In Book 5 of the Dublin Murder Squad series, two detectives are given new information about a cold case—a boy’s murder on the grounds of an exclusive school for girls. (A)TCK credentials: Tana French was born in Ireland but grew up in Italy, the USA, and Malawi during the years her family traveled with her father’s career as a development economist. How we heard about it: I’m an avid reader of murder mysteries and fell in love with this series by French last year. In fact, I wrote about her Dublin Murder Squad series , and how it deals with issues of displacement, for my first Booklust, Wanderlust column. Synopsis: In a story that mirrors the author’s own life as a TCK, an expat family’s daughters search for their own identity and confront tragedy. (A)TCK credentials: Sonnenberg was born in the USA but lived in the UK, Germany, China and Singapore as a child and teenager. She now lives in Berlin and treats Hong Kong as her second home. How we heard about it: ML is always on the hunt for a good book about TCKs, so when she mentioned having read a review of the book last summer in the New York Times, I agreed to write a column about it. Synopsis: A series of entertaining mini-essays examines the stereotypes of French life, so beloved of the British in particular, only to discover that many are completely false. Expat credentials: Eatwell, of mixed Asian and British descent, went to France for a long weekend one August summer holiday many years ago, and never left (how could she, with a surname like that?). After graduating from Oxford University, she trained first as a BBC television producer and then as a lawyer. Over the years she has worked as a documentary film maker, barrister, teacher, mother, and—most recently—full-time writer, both in London and Paris. They Eat Horses, Don’t They? is her first book. How we heard about: Eatwell’s book is the winner of the 2014 Next Generation Indie Book Award in Amazon’s Multicultural Non-Fiction category. Synopsis: A compilation of stories by expat bloggers in the Netherlands. Expat credentials: Too numerous to relay. Synopsis: Spiced with the author’s own heart-warming anecdotes, the book aims to help you arrive at the same place her own family is now—but in half the time: living and loving family life in Spain! Expat credentials: British born Lisa Sadleir is mother to two young, bilingual children. Educated in the UK and France, she has been a resident in Spain for over 23 years. She works as an independent relocation advisor and personal property finder. Synopsis: A photographic love letter to Paris from the author of the best-selling Paris in Color, capturing the hidden corners and secret moments that make Paris the most romantic city in the world. Expat credentials: After a successful career in New York City as a writer and creative director for ad agencies, Robertson moved to Paris, which rekindled her love of photography and led to creating a series of prints and now books celebrating her relationship with the City of Light. Synopsis: In this follow-up to her best-selling Lessons from Madame Chic, Scott has divided the book into two sections: 1) Chez Vous: exploring how to get your home in order and how to love it again; 2) Les Routines de la Journée: covering the pleasures of the morning, the pleasures of the afternoon, and the pleasures of the evening. Expat credentials: Once upon a time, Scott was a college student living with a “chic” family in Paris, France, and her books represent her attempt to translate all that she learned from that European experience into her American lifestyle. Synopsis: Life as a foreigner in Denmark, one of the world’s most homogenous countries, isn’t always easy. In this book, based on her popular podcast series, Kay Xander Mellish offers a fun guide to Danish culture and Danish manners, as well as tips on how to find a job, a date, someone to talk to or something to eat. Expat credentials: An Wisconsin-born journalist, Mellish has lived in Denmark for more than a decade. How we heard about: Mellish’s humorous and somewhat irreverent take on expat life caught our attention about a year ago, when she posted a story about the first woman to guard the Royal Palace at Amalieborg, who was fired not for being a prostitute but for refusing to follow orders and stop moonlighting—a post for which Mellish earned her one of our coveted (?!) Alice Awards. We were pleased to learn she’d published a book, and plan to feature it soon. Synopsis: Swift has distilled her formula for a successful international relocation into a 6-step process, outlined in this book for those making the big leap from the UK to Australia. Expat credentials: Since her birth in Singapore to a British father and Singaporean mother, Swift has lived across five continents, experiencing life and cultures of 14 countries. Her move to Sydney from London in 2005 was her 18th international relocation. She lives in Sydney Inner West with her husband, both now Australian citizens. Your turn again, readers! Have you read any of the above works and if so, what did you think of them? And can you suggest other works to add to these three categories or to the ones presented yesterday? Beth and I look forward to reading your comments below. Intrigued by some of these titles? Go ahead, download a few! ‘Tis the season to support the output of other international creatives. In closing, please note: Beth and I may repeat this exercise in six months (summer reads). But if you can’t wait until then, I suggest that you sign up for our DISPLACED DISPATCH, which has a Recommended Read every week, and also follow our Pinterest board: DISPLACED READS. Without further ado, we thank you for making this year great and wish you a season full of mirth and good cheer, along with the odd quiet moment for a displaced read or two!